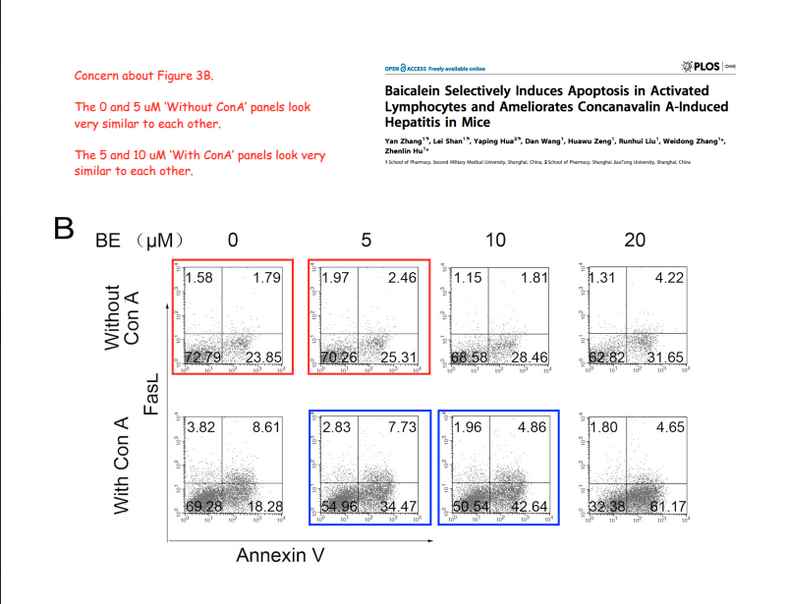 A comment on PubPeer notes that one of the figures (see image to the right) contains two similar-looking flow cytometry images labeled with different values, which could be what the retraction is hinting at. The journal is retracting the 29 March 2011 article cited above. Based on information reported after publication, this article was found to contain incorrect data and invalid statistical analyses. The journal and chief editor have therefore decided to retract the article in its entirety and apologize to the readers of Frontiers in Pharmacology. The corresponding author agrees with the retraction of the article and also apologizes to the readers. About 4 months ago, it was brought to our attention by readers that the flow cytometry results presented in the first two panels of Figure 5, with the condition of 0 μM BA in immature and mature DC, are highly similar. After checking the raw data based on which Figure 5 was generated, we realized that the result presented in the 0 μM BA mature DC panel is incorrect. In order to correct this error, we had submitted a corrigendum to the journal, in which the explanation why the error occurred was given and the correct flow cytometry result for the condition of 0 μM BA in mature DC was presented. However, following the peer-review of our corrigendum, additional technological issue was raised regarding the method used the experiment of Figure 5…[Reviewers] believe that objective errors in the methods, applications, or interpretations were identified here and refused to publish the corrigendum. Since we cannot entirely exclude the possibility that incorrect data may be produced from the JC-1-staining assays without compensation controls, we agreed to retract out article. Right now we cannot decided whether to republish yet because we need at first to re-perform the assays under more carefully controlled experimental conditions, such as using a “positive control”-treated sample as a compensation control for setting fluorescence compensation. The paper has been cited three times, according to Thomson Scientific’s Web of Knowledge. The paper has yet to be cited. Indeed, “accidental” figure duplication in two papers by same group. Hats off to Frontiers editors and referees, who stopped this embarrassing Corrigendum and enforced retraction. Hope PLOS One will do the same. Minus one pedant point for combining “data” with a singular-form verb! Ideally, rather than waiting for a corrigendum to notice the issues with the methodology, peer reviewers would have applied the same attention to the original article.